2 days, 16 hr. This is Anatomy "Optimize". The format will be lecture with “fun” lab practicum activities. The lecture will cover Muscle Origins, Insertions & Actions. Beyond this, students will also learn medical terminology, skeletal landmarks, movement direction, muscle orientation, and contractility. It is from these basics in which Anti Gravity Massage Principles are introduced and its relevance to massage therapy with regards to natural laws. 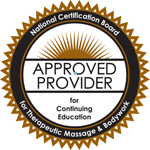 A more “Knowledgeable” massage therapist, gets more clients and a better return rate. 2 days, 10hr.workshop. Both days includes a short power point presentation on the associated anatomy followed by hands on practicum. Students will learn Postural Analysis using the Kinematic Chain. Afterwards, they'll identify asymmetries and learn to correct them, thus relieve patient’s of their pain, as if it were "magic" using traction, de-rotation and Anti Gravity Massage. Day I covers the feet to hips. Includes treatment perspectives related to the feet, hip alignment, itband syndrome, etc.. Day 2 covers the Head -Hips, as well as the arms. Techniques for eliminating carpal tunnel, tendonitis and shoulder dysfunction etc will be demonstrated. PCM is a 3hr workshop. You’ll learn to deliver a killer 20 minute Chair Massage with correct Body Mechanics. You’ll learn the top 4 repetitive strain injuries, people get from working on computers, and then you’ll learn the Cool Moves to relieve and prevent patient's pain. Body Opt. offered in 3 different ways ,18 Hrs/ CEUs. a Revolutionary Healing Art Form, coming with philosophies & healing principles to help guide your treatment for optimal results. You’ll be introduced to an assessment tool on how to map the body’s asymmetries and predict the location of your client’s pain. You'll learn 15 ”Million dollar moves” designed to specifically ”Unwind” muscle tension, correct your client’s asymmetries and realign joints from head to toe. They were developed to decrease the amount of effort on the practitioner even while working "deeply" on the largest clients. Body Opt. is the Science behind what you have intuitively known as a massage therapist. Combine these two forms of knowledge & become a more powerful healing arts practitioner. SOS is a 6 hr. workshop and lecture. Topics covered are Basic Anatomy of the lower spine and pelvic girdle, Biomechanics of the lower spine and pelvic girdle, Pathway of the Sciatic Nerve and Postural Analysis. Treatment of the Sciatic Nerve using eight different healing principles, including muscle energy techniques, Cranio-Sacral, Mckenzie etc. or call me at 415 456-1740. 2018 SCHEDULE:...so far, DATES, TIMES, COST & LOCATION. Body Optimalization: 3 day, 18hr, 18 CEUs. Make check payable to Al Chan. Please send Tuition as a gift, or to family to avoid fees. For credit card. We have Square.